Intermittent fasting now seems to be a household term. It is being promoted by individuals in the health and wellness scene, as well as being employed in the medical field to help stem the tide of metabolic disease. Fasting strategies can take many forms; from alternate-day fasts to fasting-mimicking diets and even the 5:2 method. One of the most intuitive and easy to implement approaches is simply to condense the eating window during the day, a strategy known as time-restricted feeding (TRF). In contrast to eating over a 12-hour period, typical of a modern dietary paradigm, TRF limits daily food intake to a shorter time-frame (~4-10 hours) and extends the overnight fast. Recent studies using fasts of this nature have reported positive effects on weight loss, glycemic control and appetite regulation. By adhering to a narrower eating window, weight loss may be achieved during TRF through a spontaneous reduction in overall caloric intake. 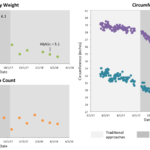 In a real-world setting, these improvements in body composition are clearly advantageous for metabolic health, especially in those individuals who are already prediabetic. However, from a scientific perspective, it has been difficult thus far to gauge whether intermittent fasting has benefits independent of weight loss. A breaking new study published in Cell Metabolism has investigated this issue exactly, demonstrating beneficial cardiometabolic effects of TRF despite weight maintenance. 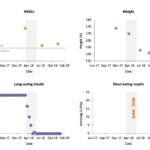 Dr. Courtney Peterson and colleagues (University of Alabama, Birmingham) conducted a rigorous 5-week, randomized, crossover feeding trial on 8 prediabetic men. 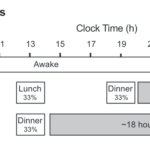 Participants were asked to adopt either an early TRF (eTRF) schedule – consisting of a 6-hour eating window, whereby the final meal was consumed before 3pm each day, or a control 12-hour eating schedule (Figure 1). After a 7-week break, each participant was switched over to the other schedule. Crucially, food intake and meal composition was matched across both experimental arms and each participant intentionally fed enough food to prevent any reductions in body weight. Compared to the control 12-hour schedule, eTRF decreased fasting insulin, as well as the overall level of insulin during an oral glucose tolerance test. This test demonstrated that eTRF led to improvements in both insulin sensitivity and β-cell responsiveness, the latter being an important indicator of pancreatic function. The other notable benefit observed with the eTRF schedule was a significant decline in systolic and diastolic blood pressure. Interestingly, the extent of this decrease may be equivalent to that achieved with some anti-hypertensive medications, suggesting that dietary interventions aimed at reducing circulating insulin levels may be a better alternative. While eTRF did not alter cholesterol parameters or markers of inflammation, it did reduce levels of 8-isoprostane, a marker of oxidative stress. A common critique of most TRF protocols is the assumed increase in hunger during the longer fasting periods and thus doubts over compliance. In the present study however, researchers found that participants on the eTRF schedule scored lower on most subjective measures of evening appetite, such as the desire and capacity to eat, while ratings of satiety increased. Interestingly, subjects actually reported that the consumption of all their food within a 6-hour period was a greater challenge than enduring the 18-hour fast, highlighting the feasibility of these interventions in future settings inside and outside of the laboratory. This well-controlled TRF schedule centered around the early part of the day is a novel intervention, incorporating both fasting and an appreciation of our biological rhythms. The circadian clock regulates metabolism in response to different nutrients and based on the timing of food intake. Key endocrine functions such as insulin secretion and insulin sensitivity appear to be optimal in the morning, suggesting that concentrating food intake within the earlier daylight hours is superior for circadian alignment. Hopefully, future studies of similar rigor might investigate how much the effects of TRF depend on the time of day, as well as the macronutrient content of meals. 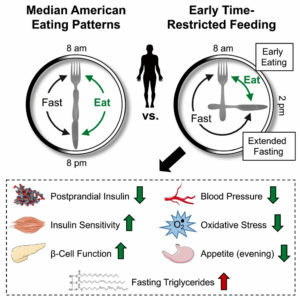 Applying this kind of experimental design to a greater number of participants (and with the inclusion of women) should provide insight into the relationship between fasting, dietary composition and circadian timing.